Be the first to share your favorite memory, photo or story of Antone. This memorial page is dedicated for family, friends and future generations to celebrate the life of their loved one. 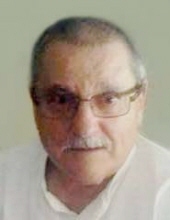 DARTMOUTH-Antone "Tony" Amaral, 77 of Dartmouth, died Saturday, February 9, 2019 at home following a period of declining health. He was born in Povoacao, St. Michael, Azores, coming to this country in the1950's and resided in Dartmouth for 41 years. He was the son of the late Manuel and Georgiana (Lopes) Amaral and the husband for 54 years of Patricia P. (Medeiros) Amaral. Antone was formerly employed by Angelo's Seafood in Seekonk as a fish cutter until his retirement. He was a communicant of St. Julie Billiart Church. Everyone is invited to St. Julie Billiart Church, Slocum Road, North Dartmouth, Friday morning for a Mass of Christian burial to be celebrated at 10:00. Interment in St. John Cemetery. In lieu of flowers, donations may be made in his memory to Southcoast Hospice Visiting Nurse Association, 200 Mill Road, Suite 120 Fairhaven, MA 02719. Funeral arrangements entrusted to AUBERTINE-LOPES FUNERAL HOME, 129 Allen Street. For online guestbook, directions and additional information, please visit www.aubertine-lopes.com. To send flowers or a remembrance gift to the family of Antone "Tony" Amaral, please visit our Tribute Store. "Email Address" would like to share the life celebration of Antone "Tony" Amaral. Click on the "link" to go to share a favorite memory or leave a condolence message for the family.